The Fitbit Flex Wireless Activity + Sleep Wristband is the ideal product for active people who are wanting to encourage themselves to live a healthier lifestyle through exercise, diet, and improved sleep. Users can track their steps, calories burned, and overall active minutes with a slim wristband that vibrates when goals are met. For just $99.95, buyers can get an all-in-one pedometer that also tracks their sleep cycles and lets the wearer know exactly how much sleep they’re getting. If someone is wanting a nifty little gadget to help them get more active and improve their lifestyle, the Fitbit Flex Wristband might just be the product for them. The Flex Wristband by Fitbit is user friendly, meaning there’s very little learning curve to learning to operate it. With just a few quick taps, the Flex is easily set up and ready to use almost immediately. The FitBit transfers information to a smartphone or tablet wirelessly, meaning it’s easy to transfer all of the day’s data and see it all laid out in handy graphs and charts. Data transferred to the Fitbit app includes the total steps taken at the time of syncing, the amount of calories burned that day via activity, and how many minutes the user has been active. The app can be synced with popular weight loss apps like MyFitnessPal, Runkeeper, and Sparkpeople. Using the app, the desired daily goal of steps can be set. As the user reaches that goal throughout the day, each time they hit 20% of their daily total, the Fitbit will light up and vibrate to alert them that they’re getting closer. Users can choose to be alerted on their total distance walked, steps taken, or calories burned. The Fitbit will track sleep throughout the night; all the user has to do is tap the wristband to send the Fitbit into sleep mode and it will carefully monitor how often its owner tosses and turns throughout the night. Via the app, an alarm can be set and the wristband gently vibrates to wake only the user and not anyone else who may be in the same room as them. The wristband comes in a variety of colors (navy, black, slate, teal, and tangerine) to fit any wardrobe. It’s completely waterproof so the Flex can be worn safely in the shower without fear of ruining it–or losing track of daily goals. 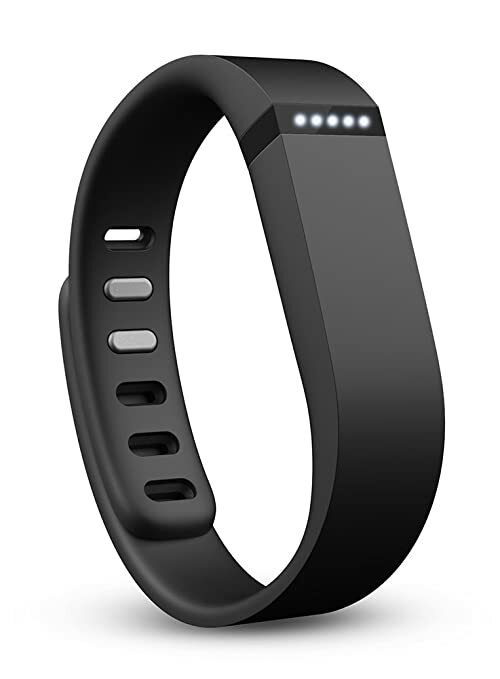 Each Fitbit comes with two sizes that fit wrists from 5.5″ to 8.2″. The elastometer material means it’s easy to clean no matter how sweaty it gets and is always comfortable on wrists, even for sleeping. No battery indicator. Users have to remember to charge about every five days or risk having their unit die unexpectedly. The battery life is also relatively short at only four to five days for holding a charge. The clip on the wristband can be tricky to get on one handed. Users must have a smart phone or tablet to get any instant visual feedback. Some users have complained of moisture collecting in the pouch where the Fitbit sits in the wristband, meaning if it isn’t dried out, it’s prime real estate for mold or mildew to grow. The Fitbit is sensitive enough that when pushing a shopping cart, the vibrations/bumping will set off the Fitbit and send it into sleep mode. There have been some reports of the “gentle” vibrations to awaken users is not all that quiet or gentle. If users are looking for an easy to use pedometer, this product is worth evaluating. It’s unlike traditional pedometers in that it stays on the wrist and isn’t subject to falling off of a waistband or the hem of a pocket. Because it seamlessly teams up with today’s technology, there’s nothing old fashioned about this product. The Fitbit Flex’s competition, the Jawbown UP24, is comparable but does have a few more features like a barcode scanner for food tracking, a stopwatch, and a longer battery life for a slightly higher price tag of around $100+. However, for the price, the Fitbit Flex is a solid all around deal with its easy syncing, sleep tracker, comfortable fit, and varied goal setting options.